For those who have tried to start WampServer with Skype already running, you might have been faced with the yellow icon in the windows notification area and WAMP not starting. This is because Skype is using Port 80 and 443 as alternatives for incoming connections and apache wants to listen to Port 80 as well, therefore causing WAMP to not start up. 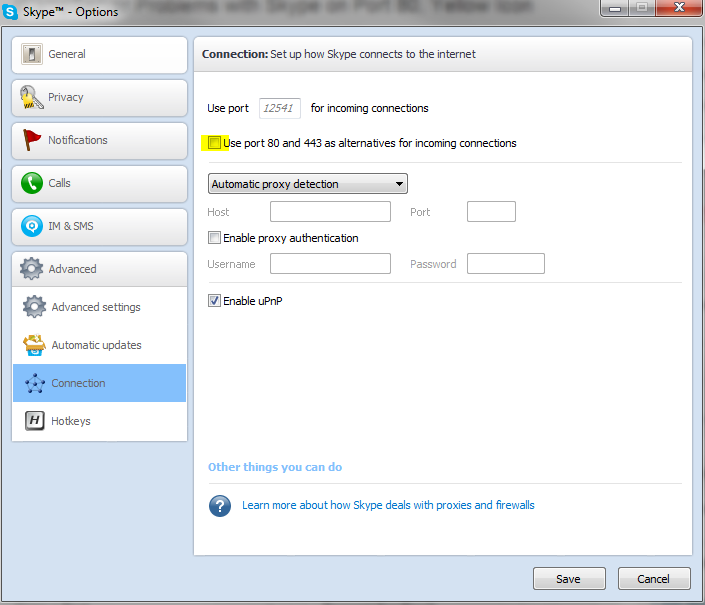 To disable Skype from using Port 80 and 443, go to Tools > Options > Advanced > Connection, then uncheck the ‘Use port 80 and 443 as alternatives for incoming connections’. Now close Skype, and restart WAMP by left clicking the WAMP icon in the system notifications and selecting ‘Restart All Services’ under ‘Quick Admin’. My suggestion to anyone who is having this problem is close all other programs that might be listening to Port 80 on your computer and then open up WAMP.